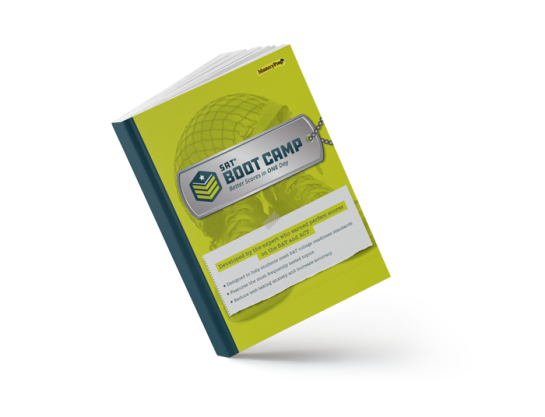 Our Boot Camps have been proven as effective prep in the “final hours” before the test. In just one day, students will learn what they need to boost their scores by 50–100 points or more! How can the SAT Boot Camp help your students? Teachers certified to educate and motivate. A crucial part of all of our Boot Camps are our trained instructors. A MasteryPrep-trained expert will engage your students in a lively workshop, sharing effective strategies and tips for your students to practice in the days leading up to their test date. Your students will cover content-strategies for all subjects tested on the SAT. Each subject comes with mini-tests that the instructor will use as a simulation of a real SAT test day. After students complete each mini-test, the instructor will go over any questions that the students might have gotten wrong or had difficulty solving. Relax and leave the prepping to us! Students learn a special sequence to read the passages, which prevents them from running out of time and losing points. Students learn how to approach questions with confidence. Students learn tips on how to actively read and avoid the common pitfalls that eat up time and cost points. Students learn how to manage their time and maximize points. It’s inevitable that students will have to guess on some questions. We show students how to play the odds. Some students overthink their way to the wrong answer—the tips in our SAT Boot Camp will lead them to the right answer in less time. Simple errors kill scores. We review the errors that students are most likely to make and show how to avoid them. There’s one strategy that trumps all others on the Math test. Students will gain a deep understanding of how this strategy works and learn how to extend it to even the trickiest questions thrown at them. For a sneak peek of the workbook, simply fill out this form and we'll send a free sample right to your inbox! Each student participating in a SAT Boot Camp will receive their own take-home workbook for extra practice and study. The workbooks equip your students with actual SAT questions and detailed answer explanations for any questions where further clarification is needed. Preparation beyond the one-day workshop. We know planning school events can be difficult—our schedules are flexible! SAT Boot Camps can be scheduled during the school day or on the weekend. It's never too late for an SAT Boot Camp! We've specially designed our workshop to be implemented in the final weeks leading up to a test. Ready to book a SAT Boot Camp for your school? Get a free quote today in just 3 easy steps! Although we don't sell to consumers, you can take part in recommending MasteryPrep to your school! If there's a school staff you can refer us to, email us their information at betterscores@masteryprep.com and we'll gladly reach out to set-up an appointment! Simply fill out the form and one of our expert team members will contact you shortly! With our programs and specialized training, we aspire to equip all teachers with the right tools and strategies to properly prepare their students for college. Click here to learn more about how MasteryPrep can make a difference in your school. © 2019 MasteryPrep. All rights reserved. SAT is a trademark of the College Board. MasteryPrep is in no way affiliated with or endorsed by the College Board.